SNCF 2-8-2 141.R.420, Lapeyrouse, Mon 2 May 2005 1 - 0935. Day 2 of the Mediterranean Steam Express was a trip from Clermont Ferrand to Montlucon via Gannat both ways. The train was hauled by this 141R, seen here taking water. Over 1,300 of these rugged locos were built in the USA and Canada in 1945 - 1947 for France's war -ravaged railways. Very different to traditional sophisticated French compounds, they were immensely successful mixed-traffic machines. 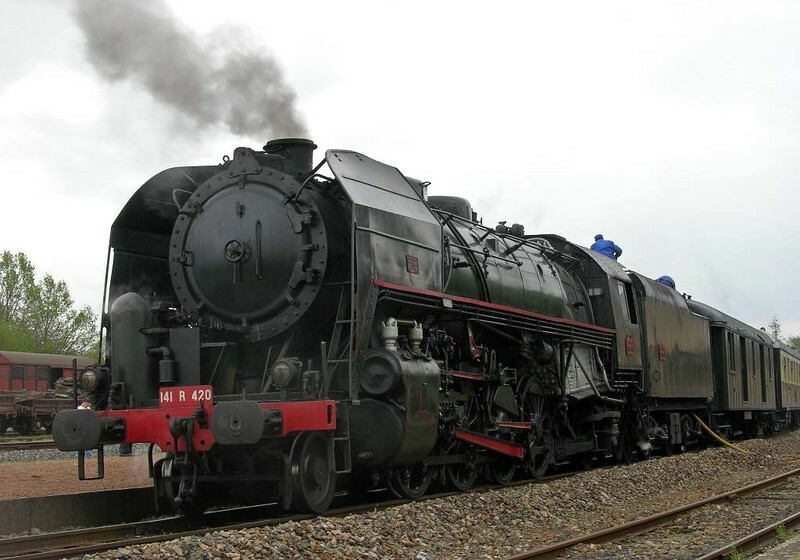 In 1968, the SNCF had 919 steam locos in service; no fewer than 604 were 141Rs.